Clubrosa! 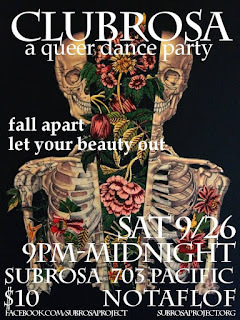 A Queer Dance Party! Start the fall off right Saturday night! Come dance. Bring your fabulous selves in whatever forms that may be. Hella glam, hella femme, hella square, hella quiet, hella sassy, a little bit of everything. This is a space for you to do you and be loved for it. This is a brave space where we invite everyone to show up for each other. Bring your friends. Make new ones. This is only the beginning. Join us for First Friday Festivities! After almost 7 years of supplying our books and zines our friends at Black Powder Press have moved away! As part of our parting we bought a bunch of books from them and are looking to establish a new book and zine routine. This takes money! So we are challenging you to help us! During this First Friday event we will have a special bowl, jar, cauldron for donations and we will be DOUBLING YOUR DONATIONS up to $1,000!! If you support Subrosa and this radical, diy, downtown community space this is the night to throw down. We will have wine and snacks and music for your enjoyment, come hangout! ALSO! We will have local anarchists heckling and daring you to throw tomatoes at them! Yep. This time you get to throw things at us! Bring some $1s and your best aim and make us look silly! Can you stand the heckle? and every Monday at 7pm in October at SubRosa! 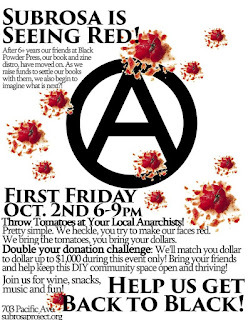 Oct 5th: What is Anarchism? "This series of seminar sessions has been put together to encourage the exchange of ideas, experiences, and knowledge surrounding a particular topic or theme. We want to create a place where people can meet with other people from Monterey Bay communities to talk about current events and discuss new philosophies and ways of thinking critically about society. Though these seminars have been designed for non-students, and for those of us who have had little or no college experience, everyone is invited to participate. We believe that everyone can have something to offer to the seminars as we move through current debates in politics and different political and social theories." What do people mean when they say "Anarchism"? Between the international Occupy movement, and questions surrounding capitalism, Anarchism has been a topic that has been much in the media in the last few years. This seminar will introduce you to the philosophies of Anarchism through key readings, and then use these philosophies to discuss current events. What is the function of domestic labor under capitalism? Why were women pushed out of the factories after the war? How can we understand the "unhappy marriage of Marxism and feminism"? This seminar will look at the works of Angela Davis, Silvia Federici and other key Marxist and feminist thinkers to explore the nature of the feminist movement in relation to anti-capitalist movements. Examine the ways in which structural and institutional racism interacts with the process of immigration, including the racialization of citizenship and the role of immigration in reinforcing racial identities and structures.